Tired of gift card envelopes? Place a gift card within our maze for intriguing gift-giving fun. They'll have to guide the ball on the maze path to unlock the door and retrieve their prize. Each maze fits up to five gift cards. Instructions for loading and solving included. Available in 4 colors. Measures 3" wide x 4" long x 1/2" thick. Tired of gift card envelopes? Place a gift card within our maze for intriguing gift-giving fun. They'll have to guide the ball on the maze path to unlock the door and retrieve their prize. 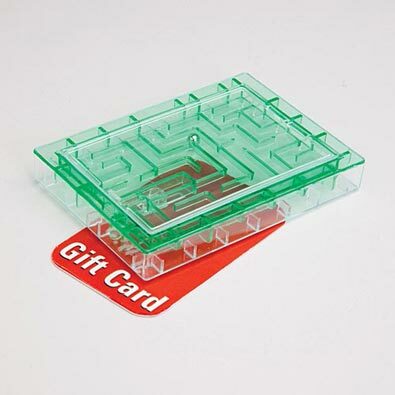 Each maze fits up to five gift cards. Instructions for loading and solving included. Available in 4 colors. Measures 3" wide x 4" long x 1/2 " thick.